Newly Built & Secluded Catskill Cottage w/ Views! Take a break from the hustle and bustle of city life in this gorgeous 2-bedroom, 1.5-bathroom vacation rental cottage in Narrowsburg, New York. Nestled on 7 private acres, this home for 6 has awe-inspiring views and a rustic farmhouse feel perfect for any occasion. Whether you're looking for a romantic getaway, writer's retreat, or family adventure, this cottage's unbeatable Catskill location, just a stone's throw from Monticello and the Delaware River, will give your trip a fun mountain flare. Hidden from the road, this beautiful cottage will blow you away the second you enter. The rustic decor featuring animal hides and wooden accents gives the 1,200 square feet space a unique yet homey atmosphere. Channel Upstate New York native Rachael Ray as you cook dinner in the fully equipped kitchen which features granite countertops, stainless steel appliances, and 365-degree views. You can even choose from the cottage's extensive record collection and enjoy some old school music as you whip up a delicious feast. Enjoy your home-cooked cuisine with the whole family on the antique farm table overlooking the property before retiring to the elegant white couch binge on your Netflix favorites. On those chilly Empire State evenings, take advantage of the magnificent stone fireplace and warm up as you unwind with a glass of wine. When the sun has set over Catskills, rest up for the next day's mountain adventures in either of the cottage's sophisticatedly simple bedrooms. With a queen bed in the master bedroom and a full bed in the second bedroom, you and your guests will drift right to sleep in this cozy getaway. 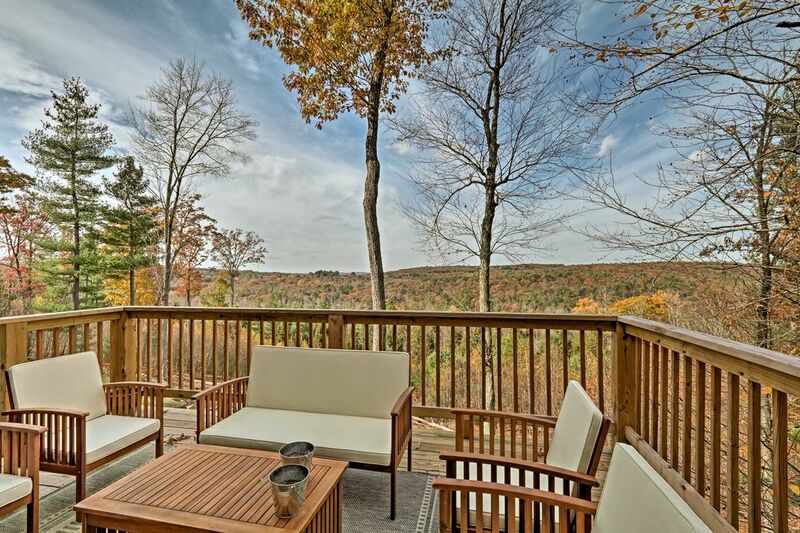 Take advantage of the Catskill's crisp mountain air by walking out through the great room and spending some time on the expansive back deck. With lots of comfortable seating and the best views on the property, this space is perfect for a romantic sunrise morning with that special someone or a fun afternoon of cards with the kids. Need a bit more solitude? Head to the front of the house and unwind with a book on one of the front porch's Adirondack chairs. This area is home to some of Upstate New York’s best restaurants. Just 10 minutes from the property you’ll find one of the region’s best-kept secrets, the Heron. Whether you’re looking for a fun brunch or nice dinner, the Heron’s delicious food and small-town atmosphere make it a must visit in Narrowsburg. Rock and roll fans won't want to miss out on visiting the Bethel Woods Center for the Arts, the site of Woodstock in 1969. Step back into the 1960s and tour the museum or catch one of the seasonal performances! Bethel Woods is just a short 20-minute drive from the property. If antiquing is your hobby, Narrowsburg is the vacation destination for you! You'll find tons of vintage goods within 20 minutes of the property. Be sure to bring your hiking boots! There are fabulous hiking trails for all skill levels in the area. A moderate 3-mile hike along the Tuscan Mountain Trail is just 8 minutes away. Borrow the available kayak and bring it down to the Delaware River, which is just 5 minutes from the property. If you don't feel like exerting that much energy, rent a tube to float down the river! The same company that rents the tubes provides a ride back to where you started. If you’re looking to venture farther into the Catskills head 40 minutes down Route 17 and explore Monticello, the transportation hub of the region. With parks, museums, and great skiing, Monticello is the perfect place for a day trip full of exploration and family fun. -Amenities include a fully equipped kitchen, free WiFi, a flat-screen Smart TV, large back deck, 2 stone fireplaces, 1 kayak, a gas grill and more! -Unbeatable Narrowsburg location - Minutes from great restaurants, hiking, the Delaware River, and 40 minutes from Monticello. This was one of the first times I have stayed at a place that really felt like a home in the mountains. The house was filled with small modern conveniences that made the trip so much better. The Bluetooth receiver connected to built in speakers was delightful and helped to always keep my spirits up. The large soaking tub helped to remove all my stress. The view and distance was enough away from others that I could finally feel like I was getting time away. I will stay here again in a heartbeat. The only thing to consider when staying here is that if you are going to cook make she to bring all essential items. Kitchen is fairly stocked and had almost all things we needed but some items you might expect might not be there, for us that was a cooling rack. So it was nothing major. Highly recommend here for couples especially. The property was very beautiful and well manicured. The view off the deck Is beautiful and the quiet is serene. The cottage was just what we wanted. It was a weekend getaway for me and my wife and it was perfect. Stone fireplace, beautiful surroundings and a lovely house to enjoy it in. The one gripe we had was there was no automatic coffee maker but we didn’t mind at all French pressing fresh grinds everyday. We will definitely be returning. This was the perfect get away for the weekend and we absolutely LOVED the home! It was nestled in the forest with beautiful views out of every window and inside it was the coziest place ever! Newly renovated and a lovely fireplace which was perfect after hiking around outside. I have already recommended this home to my friends and family! Thank you for a lovely weekend! Beautiful property! Great view, relaxing vibe. My family of four had a lovely stay and are excited to come back in the summer. The property is beautiful with great views. We saw deer and a bald eagle! Perfect cottage for a weekend getaway! We recently stayed here for a long weekend in the fall and it was beautiful! The cottage is exactly as pictured and very clean! The owner was also very quick to respond when we had some questions. We would love to stay here again, we had such a wonderful time! Thank you! It is a great property and was everything we expected.